Hultafors has, like its signature folding rules, itself unfolded to become a leading international brand. Since then they have been responsible for many innovative hand tools for measuring, marking, chopping, striking and cutting to name a few tasks. 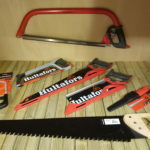 To cut to the chase, in this review I’ll be talking about Hultafors latest saws. 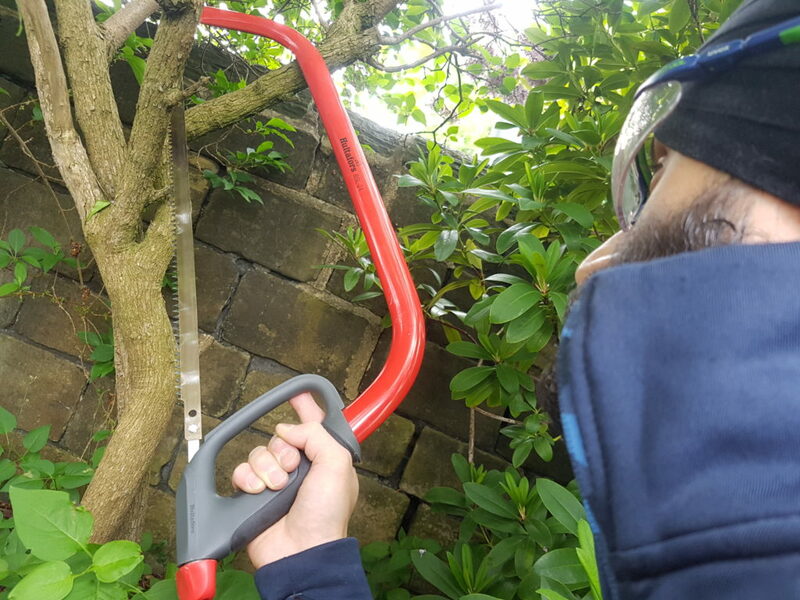 The majority of the time you’ll find a standard handsaw in your hands, but Hultafors’ HBX has some non-standard features. The first is its ergonomically designed handle, whilst the second is an eco-friendly and dual purpose wax coating on the blade. The latter helps that blade glide through the material, and also prevents rust. 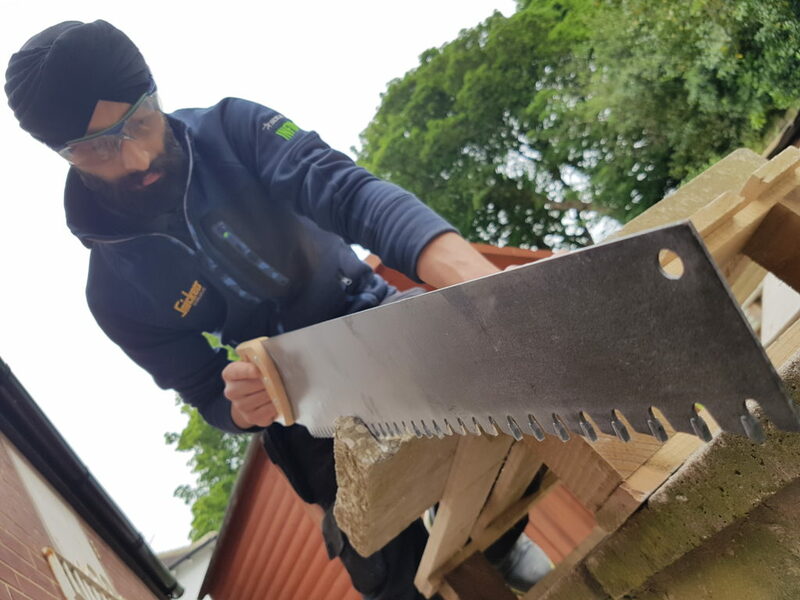 The third feature is the addition of 3-phased ground teeth, giving it a good bite for straight cuts and, at the same time, minimising the chipping of material. When the blade isn’t chewing its way through wood, the teeth are kept clean using the durable blade protector, which fits as snug as a gum shield. Another fancy feature is a quick release function that makes for easier blade changes. 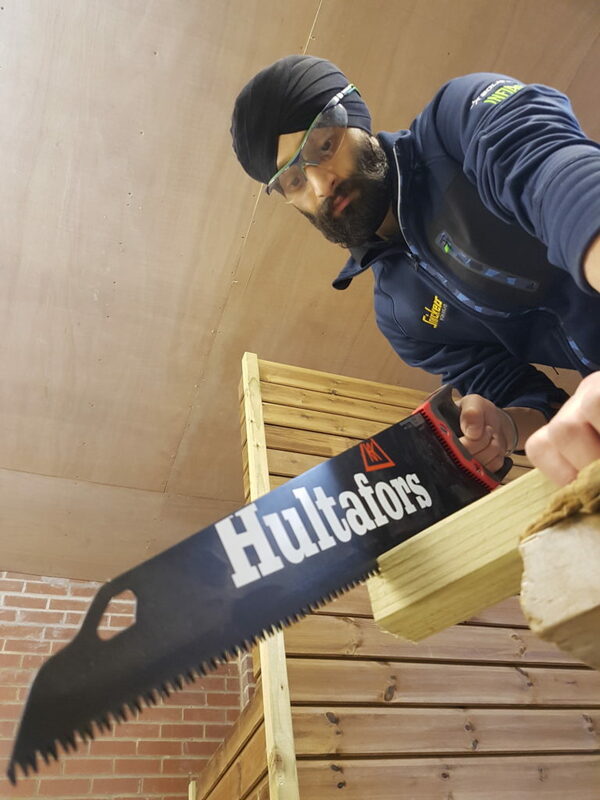 This HBX Tenon Saw has all the features of the HBX Handsaw with the addition of aluminium reinforcement at the top to increase stiffness for when the precision cutting of joints is required. I guess using aluminium makes it lighter in weight yet still allows it to serve its purpose. Something that is handy is a handle that can be interchanged between both the HBX Handsaw and the Tenon Saw. I’ve always loved the look of the Japanese Ryoba Saws. I think it must be to do with the traditional feel of the wooden handle. Personally, I’ve grown up using a Tenon Saw for doing precision work, maybe because it works in the same way as a handsaw and cuts on the push stroke rather than the pull. I did, however, fall in love with the Hultafors Pull Saw straight away. The manufacturer has got all the design aspects correct and, given that they’ve even got the SK5 steel manufactured in Japan, authenticity is assured. 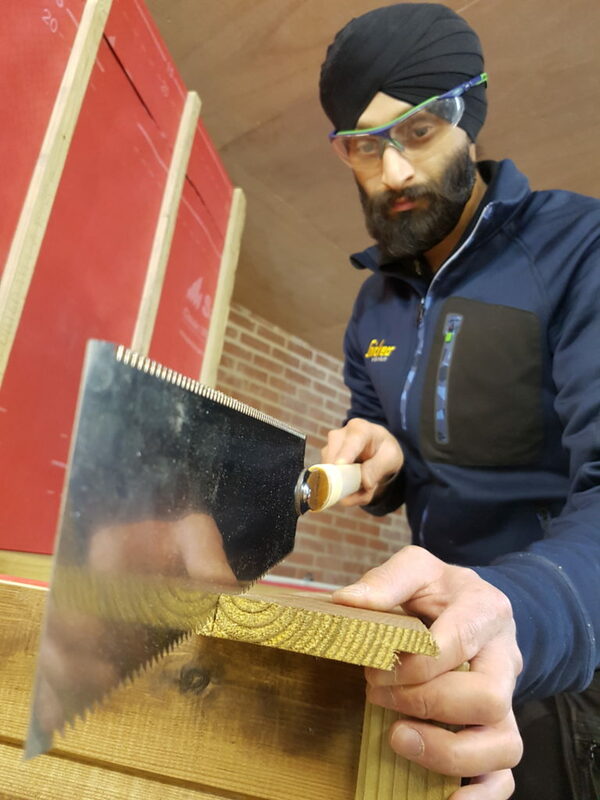 The 0.5mm thick blade allows you to get neat thin kerf cuts and, because a thinner blade means less material is being cut, it glides through the wood with less fatigue, whilst hardened teeth ensures a longer life span. The advantages of this saw is that it has two grindings – or two sets of teeth – one for ripping (along the grain) and one for cross cuts (across the grain). Something that I would also expect to have a long life span would be Hultafors Bow Saw BSL. I say this because another name for a Bow Saw is a ‘Swede Saw’ – having been invented by a Swedish company in the 1920s. 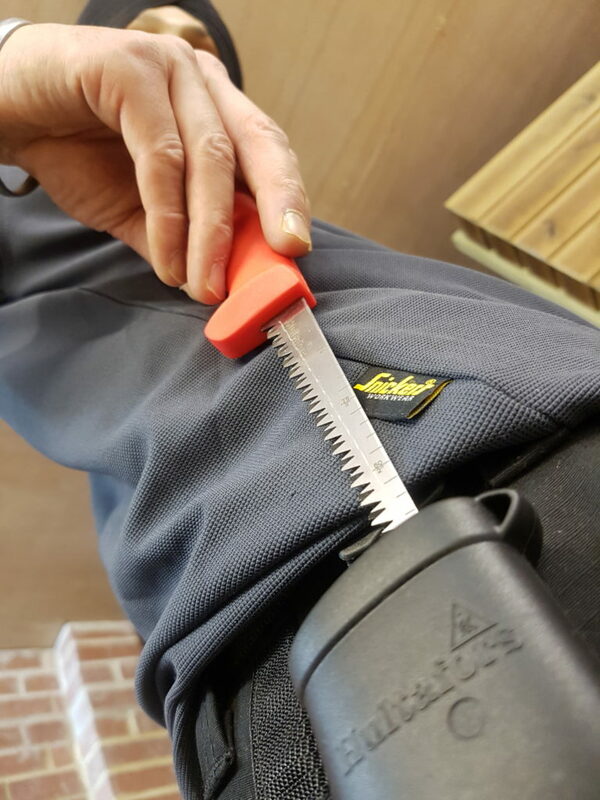 The triangle design means you get into those narrow areas, thanks to its PP (Polypropylene) handles there’s a good grip in dry or wet conditions, and it’s very safe and easy to fit the blade and get the optimum tension. The multi-purpose blade provided is also made to cut in both the wet and dry. I would say we’ve covered the wood saws that Hultafors has to offer so it’s time for the manufacturer to show its ‘metal’. 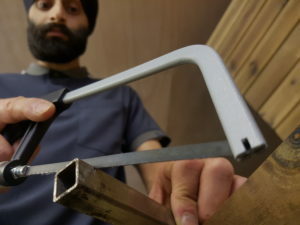 I always like to keep a big hacksaw and junior hacksaw in my tool box so it’s nice to see the Swedish tool maker offers both with its HMM (left) and HMX (right) options. I may not use these as much as the wood saws however there are times where they are needed unexpectedly. Both are very well and ergonomically designed and made from aluminium, which is light but stills feels sturdy. 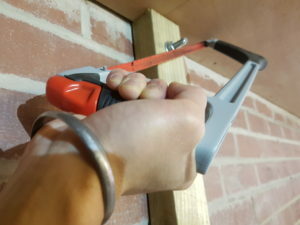 On the HMX Hacksaw there is rubber grip on the handle and the front for when you may want to exercise more control and use it with two hands. I remember the days of having sore fingers from tightening the nut to give the blade more tension, or having to use the claw of the hammer. With both Hultafors’ HMX and HMM it’s actually so satisfying when it comes to tensioning the blade. The HMX has a spring-loaded support and, with its ergonomic shape, you can easily tension it. 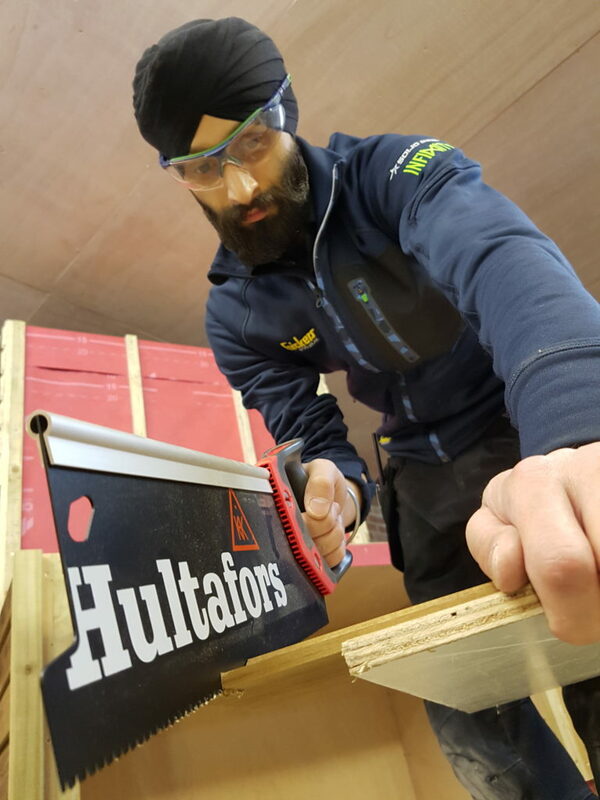 Hultafors have got this right from every angle, and, on the subject of angles, the HMX even allows you to change the position of the blade to a 45 degree, so you can easily cut flush to a surface. The Hultafors Jab Saw shares many of the same features others in the range, such as the 3-phased ground blade and anti-rust treatment. I’d say it punches through the plaster board rather than jabbing. Its knock out feature is its measuring gauge on the blade, therefore there’s no need to put your own pencil marks on the blade or even guess. It even comes with a robust holster which can be clipped to your belt, increasing efficiency and safety. Finally, Hultafors has actually made a Concrete Saw. That’s correct – they’ve made a saw for cutting porous stone-based material. The 1.6mm thick blade is made from C75 steel that has 34 carbide teeth.